I was cleaning my sewing room today getting ready to leave town for a 5 day Color Class with Hollis Chatelain. My friend Mary C. is going to use my machine to quilt on a great new quilt which will be in my pattern line soon. 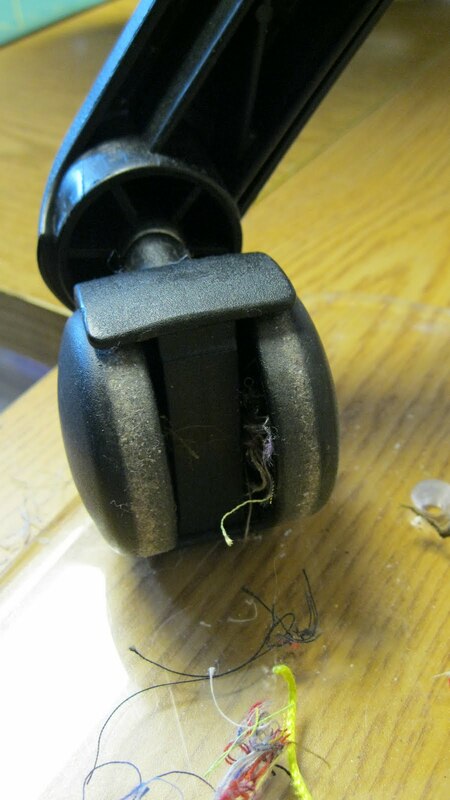 As I was sweeping I noticed some thread hanging out of the bottom of my sewing chair's casters. I decided to pull them out. As they kept coming out I decided to turn the chair upside down and work on all 4 casters. Oh my!! What a mess! I am sure I have pulled threads out before, but never have I put it upside down to work on it. I am shocked at how much came out of t he 4 wheel casters! I thought I would take a photo and share it with you, because I am sure you wouldn't believe it either! The bad news is that some of the threads are still stuck in all 4 wheels and I took a photo of that too. I removed all I could using a pair of jeweler's tweezers. All of my machines are mechanical and require oil to run safely and smoothly. I am diligent about keeping them in good repair. Not my chair though! You better believe I will be careful of the "stuff" that ends up on the floor, as the wheels pick it up like a vacuum!